It's easy to learn how to do stitch in the ditch quilting, a technique that places stitches within a seam or a hair's width away from the seams that separate the seams used in quilt blocks, and when the blocks are sewn together. Stitching in the ditch is most often accomplished by machine quilting with a walking foot, also called an even feed foot. The photo illustrates stitching in the ditch with a regular pressure foot so that needle placement is more visible, but a walking foot makes the task much easier because it grips the bottom and top layers of the quilt, feeding them through the machine at the same speed. Is Stitch In the Ditch Similar to Outline Quilting? 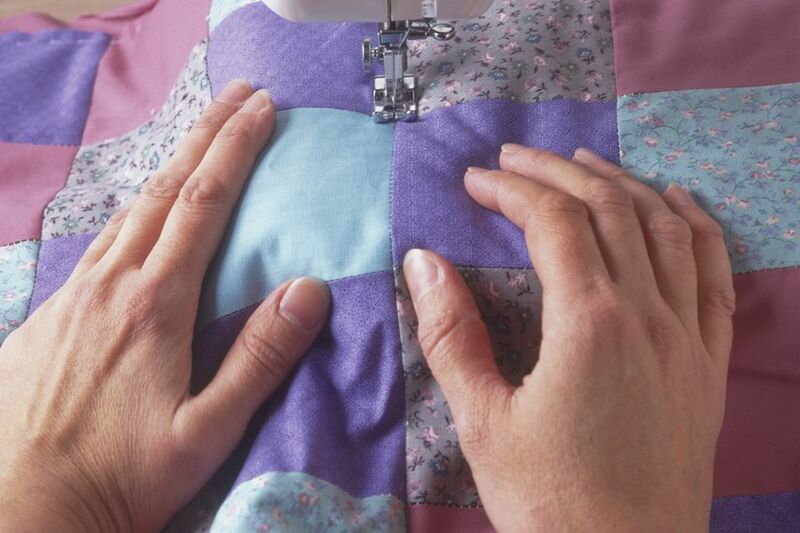 Some quilters prefer to stitch 1/8" or 1/4" away from seam lines, but that technique is called outline quilting since it creates an outline of the patches that the quilting stitches surround. Is Stitch In the Ditch Quilting Invisible? Even though stitching in the ditch is usually invisible on the top of the quilt, the stitches do add depth where they compress the quilt batting and are completely visible on the back of the quilt. All types of quilting stitches secure the three layers of a quilt sandwich. Quilters often hide stitch in the ditch quilting by working with either a matching thread or a very fine transparent thread called monofilament. Not all monofilament threads are suitable for quilts—avoid thick threads that look more like fishing line! Stitch in the ditch can also be used to sew quilting stitches around applique motifs, but outline quilting stitches are more common in applique quilts. Like any other quilting skill, stitching within in a seam takes practice. Begin by dropping the sewing machine's needle between the two fabrics that meet at a seam. Bring the bobbin thread to the top of the quilt. Determine which side of the seam is a bit higher—this is the side that the seam allowance was pressed towards. You want stitches to fall on the other, lower side of the line. Nudge your needle just a bit if necessary for best placement. Your seams may not all be consistent. Don't stress, just keep stitching a smooth, straight line, even though the stitches may end up on top of a seam allowance. It's helpful to make a stitching plan by examining your quilt before you begin sewing to identify which way the bulk of seam allowances are pressed. Stitch along the seam line, pulling the fabrics apart slightly on both sides of the seam as you sew. Sew all the way to the end of the seam on the quilt top. If you find that it's difficult to spread the fabric apart as you sew, take a break. You'll feel more comfortable with longer machine quilting sessions as you practice the technique. You might want to try wearing a pair of gloves to help grip the quilt, and if you enjoy any type of machine quilting a pair of quilting gloves could be a good investment. Depending on your quilt, and how large its patches are, you may need to sew additional machine stitched lines in other areas, away from the seams. Read the instructions that came with your quilt batting to determine the minimum distance apart that stitches must be sewn in order to keep the batting intact when the quilt is used and when you launder the quilt.